How Many Small Children Die From Mistaking Medicine For Candy? We're not sure how many small children die from mistaking medicine for candy, but the Centers for Disease Control say that approximately 30 children in the United States die every year from accidental poisonings. There are no statistics to tell us whether the children thought they were eating candy, but most of these accidents occur in the home. Since most small children can't read, they're not going to see the warning signs on medication bottles. This information is written for adults, so it's up to you to keep your little ones safe from accidental poisoning. Since kids are attracted to bright colors, they are curious about the contents of medicine packages. For this reason, it is urgent to talk to your small children about the dangers of eating something they're not supposed to. Children love to imitate adults and often see their parents taking medicine. Sometimes children can confuse medicine with candy, and this is something you want to watch out for. Between 2004 and 2005, an estimated 71,000 children under 18 years were seen in emergency departments each year because of medication poisonings. Over 80% of them were because an unsupervised child found and consumed medicines (FROM: Schillie SF, Shehab, N, Thomas, KE, Budnitz DS. Medication overdoses leading to emergency department visits among children. Am J Prev Med 2009;37:181-187).The Children's Hospital of Philadelphia says that every 15 seconds in the United States a Poison Control Center gets a telephone call. Over half of the calls are made by an adult in regard to a child who has swallowed a potentially toxic substance. These substances include medicine, as well as common household chemicals. To prevent a child from needlessly dying, never call medicine "candy" to entice them. Make sure all pill bottles have child resistant lids, and keep all medication out of their reach. And talk to your kids about the dangers of eating unknown objects. What Are Root Beer Candies Made of? Children and adults can instantly identify the flavor of root beer, but many wonder what the candies are made of. These are the typical ingredients in root beer candy: sugar, corn syrup, natural and artificial flavors, citric acid, FDC yellow #5 and yellow #6. Root beer the soft drink, was originally made using the root of a sassafras plant for the primary flavor. In 1960, the FDA banned the use of sassafras oil as it was found to be carcinogenic in animals.What we know as root beer today is a far cry from the original flavor before 1960. But most people would rather be safe than knowingly drink something that can cause cancer. Other ingredients used to make root beer are: anise, burdock, cinnamon, dandelion, ginger, juniper, spikenard, sarsaparilla, vanilla, wintergreen, yellow dock, as well as unknown artificial ingredients that sort of taste like root beer. Because this flavor is so popular, many other things are made with the flavorings such as root beer barrel candies, stick candy, cough drops, root beer schnapps, ice cream, and root beer flavored baked beans. Because most people grew up loving root beer barrels, they are in most of our retro candy birthday boxes. Are You Gypped if Your Birthday is on Christmas? Do people who have a birthday on Christmas get gypped? A lot of kids might feel they're getting short changed when it comes to their birthday celebration if it happens to fall on December 25. When most children have their birthday, there is a party with plenty of balloons and cake and ice cream. But if you're born on Christmas, you might as well forget that. Instead of balloons you get mistletoe, and for the birthday cake, it's a fruitcake with candles! You get the feeling that the rest of the family is more focused on Santa Claus, decorating the tree, and baking cookies than you. And some people think because you're so special to be born on this day, you don't need an extra present! I've heard stories from Christmas babies (who are now in their 20's) who tell of getting combined Christmas-birthday presents instead of separate gifts for each celebration. It doesn't seem fair to them that their other siblings have a proper birthday while theirs gets mixed up with Christmas. After all, birthdays and Christmas are all about gifts, and most everyone would be better off if they were spread out so they reap the benefits from both special occasions. Sugar Daddy Candy or Man? Did you know the Sugar Daddy candy lollipop was originally named the Papa Sucker? It was invented in 1925 and given that name, but seven years later it was changed to Sugar Daddy. It's a delicious caramel lollipop that so many people remember from their childhood. According to the Etymology Dictionary, the term "sugar daddy" first came into existence in 1926, meaning an older man who lavishes gifts on a young woman. Sugar daddy is a common term today. Fleetwood Mac and the the Jackson 5 both had hit songs with that title, but they're not referring to the candy. At Woodstock candy we'll stick with the Sugar Daddy candy lollipop, a treat that's loved by people of all ages. It's been around for eighty-six years, and never loses its appeal. 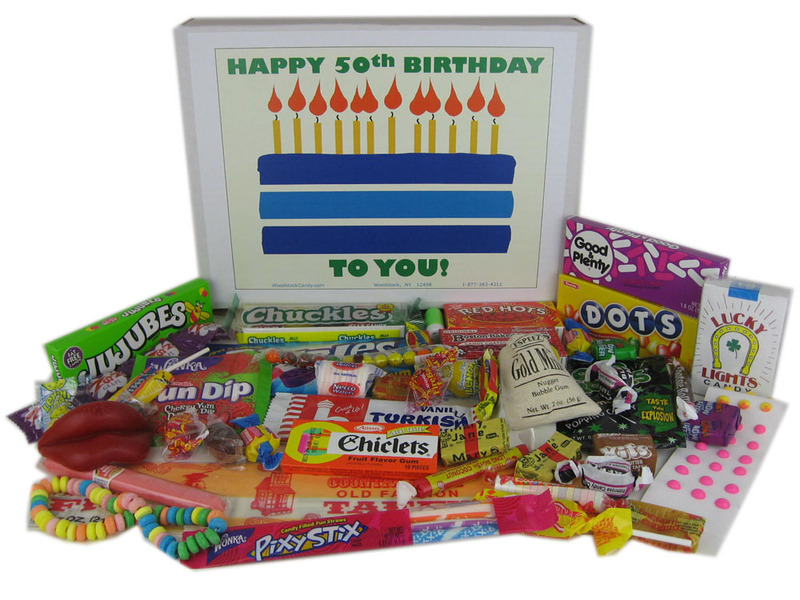 We have lots of retro candy boxes that are perfect for 50th birthday gifts. A lot of people have fun childhood memories of candy they used to get at the mom and pop store, and our goal is to bring back those good times. Forty different kinds of nostalgic candy come neatly hand packed in a box and is specifically made for someone celebrating their 50th birthday. To bring back those great memories, you'll want to give someone a candy gift that they'll remember from their youth, rather than candy that was specifically from their birth year. Most people have a connection to certain smells and tastes that remind them of when they were young. Some people say that the smell of chocolate chip cookies reminds them of their grandmother's kitchen. There's also the sweet smell of Wax Lips that is easily identifiable with a particular era. Just about everyone who had these as a youngster will instantly be transported back to when they were a kid when they open them up. 50th birthday gifts should be fun, because a person celebrating this milestone year might need to be reminded of great memories they experienced, and the prospect of lots more to come. 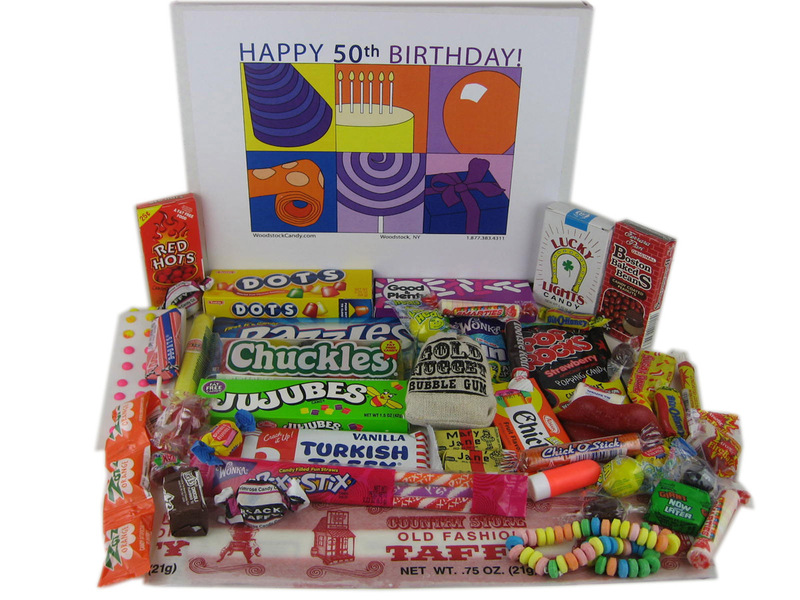 50th birthday candy makes a wonderful gift to anyone who grew up with a sweet tooth, and that will include just about everybody. We all loved candy when we were kids! And most adults still love it today, although many have curbed their consumption somewhat. That shouldn't be a problem, because there's no better time than a birthday celebration to indulge in a little nostalgia. To get started, you can go out and buy the candy in various stores, or order a box that is made for a 50 year old. Remember to look for candy that was popular when a fifty year old was a kid, not candy from their birth year. You'll want to get candy that the birthday person will remember from their childhood. There are plenty of candy collections available, and the product description will tell you what era the candy is from. For 50th birthday candy, you'll want to get stuff that was popular in the 1960s. Some sweets, like Mary Janes and Red Hots have been around for generations, so just about anyone celebrating a birthday will have had those at some point. A lot of candy is regional; meaning a kid growing up in New York would have had different candy than a kid growing up in California. Not everybody will have memories of the same candy; it all depends on what the local mom and pop stores stocked up for the kids. But one thing is for sure, and that is that 50th birthday candy will put a smile on any one's face. A birthday gift idea of nostalgic candy will remind someone of their childhood days. Most people have memories of their favorite sweets when they were younger. Usually it's been a long time since they've seen or even eaten candy that they enjoyed as a kid, so naturally they're surprised to find out that a lot of it is still being made today. Mary Janes have been around since 1914, and are still being produced. Necco Wafers are another item that are popular with every age group and continue to be made by the millions. Bonomos Turkish Taffy was discontinued at one time but has been back in production for a few years. It was one of the most sought after discontinued candies because so many people remember the ritual of putting it in the freezer and then cracking it into little pieces on the sidewalk. Everyone wants a piece of their childhood back! It's nostalgia like candy memories that give people so much delight in having the opportunity to relive their youth. A birthday gift idea that will have true meaning to someone is always the best kind. 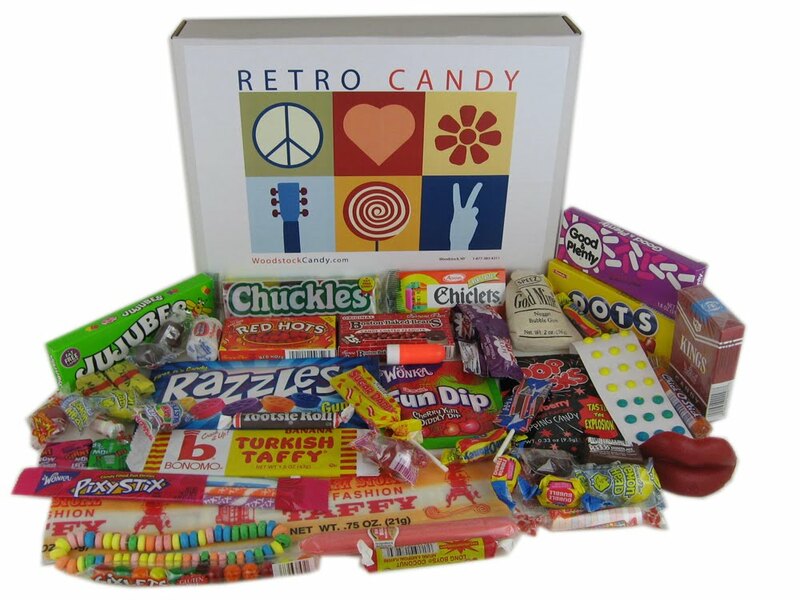 Our boxes of nostalgic candy come with lots of old fashioned favorites, and can send someone on a trip down memory lane to when their life was carefree. Because we're bombarded with so many gadgets these days, it's hard to keep track of our lives. A birthday gift idea that will bring back memories of relaxing times is sure to be appreciated. A fun gift basket box of retro candy makes a great gift for any special occasion. With Christmas coming up, it's the perfect time to put one under the tree for someone special in your life. No matter how old the gift recipient is, they will delight in all the nostalgic candy. With forty different kinds inside, there's something that everyone will remember. Maybe you grew up loving Candy Cigarettes, Pixy Stix, Chuckles, and Candy Buttons on Paper. Or maybe you'll remember Pop Rocks, Razzles, Bonomos Turkish Taffy, and Wax Lips. Either way, you'll step back in time with candy from the past. There's nothing like memories of your childhood days to make you feel like a kid again. And we need that more than ever with all the stress and activities of everyday life. Things were so carefree when you were a kid... it was all about counting pennies to see how much candy you could buy. 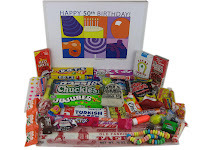 Our fun gift baskets box has all the candy you remember from the good old days, and is sure to put a smile on your face. Pigtails and Mohawks just reviewed this item, and is giving one away for free. Time's running out, so you'll need to enter right away. You've probably read through lists of other people's suggestions for 50th birthday ideas, but here at Woodstock Candy we're always into retro. Take a step back in time to the late 1960s, where everything was about peace, love, and rock-n-roll. This will be the perfect idea for a theme for your 50th birthday party. Ask the guests to come dressed in 60s fashion. This would include tie-dye, bell bottoms, headbands on the men, peasant skirts, miniskirts, granny glasses, fringed leather vests, and buttons with sayings on them. Decorate with lots of peace signs, smiley faces, tie-dye patterns, and giant 60s style flowers. And don't forget to burn the incense along with the black lights above the day glow posters. There's a great choice of music that you can play. Ask close friends to bring music like Jimi Hendrix, Jefferson Airplane, Donovan, Johnny Cash, The Rolling Stones, Roy Orbison, The Beatles, The Monkees, Bob Dylan, and Marvin Gaye. You can even burn CDs with the music you play at the party and give each guest a copy. Of course we love ideas like giving out 50th birthday party favors of retro candy to all the guests. Mary Janes, Pixy Stix, Candy Cigarettes, Bit-O-Honey, Bubble Gum Cigars, Candy Buttons on Paper, and mini Sugar daddy pops are all candies that a 50 year old will remember form their youth. The year 1969 may be nostalgic to many people. After all, it's the year that the Woodstock Festival took place, and so it became the era of peace and love. But on the other side of the country in California, forty-two years ago today, the Altamont music festival took place. On December 6, 1969 a free show at a speedway in Livermore attracted 300,000 people. Ike and Tina Turner, Jefferson Airplane, Santana, The Flying Burrito Brothers, Crosby, Stills, Nash, and Young, The Grateful Dead, and The Rolling Stones headlined. Hell's Angels provided the security, which in hindsight wasn't such a good idea. When the Stones were playing "Under My Thumb," a man approached waving a gun and started shooting. A Hell's Angel stabbed and stomped him to death. Three more people died at the concert. The Rolling Stones left via helicopter not knowing what had just happened. The Grateful Dead decided not to play because of the violence. 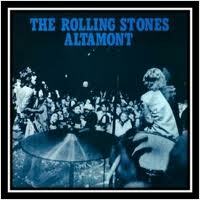 This concert was filmed and was part of a documentary called "Gimme Shelter" featuring the Rolling Stones. They have been around for 49 years! A fun Rolling Stones magnet set depicts four of their famous album covers. Altamont was a far cry from the peaceful Woodstock Festival months earlier, but 1969 was certainly a great time in music history.